The following discussion will be a review of the current interest in Avemar, a nontoxic, fermentation product of wheat germ extract, garnering interest with respect to alternative and complementary medicinal use. Mate’s Transylvania Professor Lajos David was the organizer of the Department of Pharmacy of the University of Szeged in the 1920’s. He was elected as the Dean of the Faculty of Medicine, the first and only pharmacist who reached this high position at the University since. Dr. Hidvegy’s grandfather was a devout Roman catholic, who publicly opposed Nazi persecution of Jews during the Holocaust. One of his colleagues and, perhaps his best friend, was Albert Szent­Gyorgyi, the Nobel laureate who discovered vitaminC. Szent­Gyorgyi moved to the United States after World War II, where he turned to studies of muscle biochemistry. In his later years he turned to cancer research. He theorized that a revolutionary anticancer drug could be based upon vitamin C combined with methoxy­substituted benzoquinones, the precursors of which can be found in wheat germ. After completion of the PhD, Dr. Hidvegi spent two years with the Wheat Grain Trust in Winnipeg, Canada, before returning to Hungary in 1990. He decided to followthepathwaythat Szent­Gyorgyi was now engaged intocompletehisgoals.He contacted anoldfriend,GaborFodor, a brilliantchemist, also a collaborator withSzent­Gyorgyiincancerresearch. He wasinvited by Hermann Esterbauer, the head of the Institute of Biochemistry at the University of Graz, to work in his laboratory. Thanks to the generosity of Professor Esterbauer, he accomplished much at Graz together with his student, Dr. Rita Farkas. It was soon after Szent­-Gyorgyi’s death when, with the help of Dr. Fodor, they prepared the chemicals to make the drug Szent­-Gyorgyi had intended to make, with encouragement from the great quantum­ biochemist, Janos Ladik. They made wheat germ extracts with the highest free benzoquinone content.This required a fermentation process to liberate the benzoquinone moieties from the chemical bonds which keep them in natural forms: in glycosides. He recalls the purple colored active molecules in the fermentation liquid. Living cells with their exo­ and endo­enzymes are used to split bonds and make new molecules. This is also true for the manufacturing process of Avemar. This extract contains new molecules which cannot be found elsewhere. “WhenAvemar was voted by the majority of the more than 50,000 professionals for NutrAward, it became obvious that this product is of biological efficacy plus safety, and it is based on good science.” It received the financial support needed. From this, he was able to complete the experiments and get the approval for the registration. The time arrived when he really had to give a name to the product which had only had a code name. One late night it just came: Avemar, from the Latin prayer: Ave Maria. Avemar with widely used chemotherapeutic drugs completely inhibited the development of metastases. Exploring its whole activity profile might even take a lifetime of research. So far he has supervised Avemar research done in Hungary, Israel, the United States, Austria, Italy, Spain, Slovakia, the Czech Republic, Germany,the United Kingdom, Russia, Australia, Korea, Vietnam. It has been a good experience to see the scientific interest it has generated worldwide. In 2009, Dr. Hidvegy received an invitation from the Nobel laureate, James Watson, co­discoverer of DNA’s double helix. It was a great honor. Avemar, he hopes,will be a significant cancer drug. Mate Hidvegi was born in Budapest, Hungary, in 1955. He studied, then taught at what is now Budapest University of Technology and Economics. After finishing university, he worked in the cereal industry and was co­developer of patented feed advisory system based on near infrared ingredient data. In Hungary, Hidvegi was one of the pioneers in the development of technologies for large ­scale production of instantized extracts for therapeutic use. It has been demonstrated for the ﬁrst time that a wheat germ extract prevents colonic cancer in laboratory animals. Four-week-old inbred male F-344 rats were used in the study. Colon carcinogenesis was induced by azoxy-methane (AOM). Ten rats served as untreated controls (group 1). For the treatment of the animals in group 2, AOM was dissolved in physiologic saline and the animals were given three weekly subcutaneous injections at 15 mg/kg body weight (b/w). In two additional groups Avemar (MSC), a fermented wheat germ extract standardized to 2,6-dimethoxy-p-benzoquinone was administered as a tentative chemo-preventive agent. MSC was dissolved in water and was given by gavage at a dose of 3 g/kg b/w once a day. In group 3, animals started to receive MSC 2 weeks prior to the ﬁrst injection of AOM daily and continuously thereafter until they were killed 32 weeks later. In group 4 only the basal diet and MSC were administered. At the end of the experiment all the rats were exsanguinated under a light ether anesthesia and necropsied. Percentage of animals developing colon tumors and number of tumors per animals: group 1 – 0 and 0; group 2– 83.0 and 2.3; group 3 – 44.8 (P ≤ 0.001) and 1.3 (P ≤ 0.004); group 4 – 0 and 0. All the tumors were histologically neoplastic. The numbers of the aberrant crypt foci (ACF) per area (cm2) in group 2 were 4.85 while in group 3 the ACF numbers were 2.03 only (P ≤ 0.0001). Summing up, although the chemoprevention of colon cancers (and their pre-neoplastic lesions) has well and long been established and could be achieved by totally different compounds, the mechanisms have still remained to be clariﬁed. This is also true for MSC. The exact mechanism by which the fermented wheat germ concentration can prevent colon cancer is still partly unknown. MSC did inhibit the AOM-induced ACF and colon neoplasm formation, the multiplicity of the tumors, apparently acting in the initiation phase. Regarding this, we can hypothesize that MSC acts as an immunomodulator. Summary: The fermented wheat germ extract with standardized composition has potent tumor inhibitory properties. 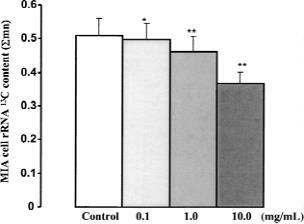 The fermented wheat germ extract controls tumor propagation. The authors show that this extract induces profound metabolic changes in cultured MIA pancreatic adenocarcinoma cells when the [1,2- 13C2] glucose isotope is used as the single tracer with biologic gas chromatography–mass spectrometry. 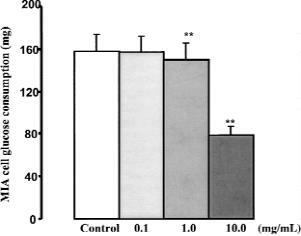 MIA cells treated with 0.1, 1, and 10 mg/mL wheat germ extract showed a dose-dependent decrease in cell glucose consumption, consumption, uptake of isotope into ribosomal RNA (2.4%, 9.4%, and 8.0%), and release of 13CO2 . Conversely, direct glucose oxidation and ribose recycling in the pentose cycle showed a dose-dependent increase of 1.2%, 20.7%, and 93.4%. The newly synthesized fraction of cell palmitate and the 13C enrichment of acetyl units were also increased with all doses of wheat germ extract. The fermented wheat germ extract controls tumor propagation primarily by regulating glucose carbon redistribution between cell proliferation–related and cell differentiation–related macromolecules. Wheat germ extract treatment is likely associated with the phosphor-ylation and transcriptional regulation of metabolic enzymes that are involved in glucose carbon redistribution between cell the direct oxidative degradation of glucose,proliferation–related structural and functional macromolecules(RNA, DNA) and the direct oxidative degradation and survival of pancreatic adenocarcinoma cells in culture. Key Words: Pentose cycle—Ribose synthesis—Fermented wheat germ extract—Nonoxidative glucose metabolism—Cell proliferation—Avemar. Figure 1. Glucose consumption of MIA pancreatic adenocarcinoma cells in response to increasing doses of fermented wheat germ extract (Avemar) treatment after 72 hours of culture. Glucose consumption (measured in milligrams) was estimated by the difference in media glucose content between Avemar-treated and control cultures. MIA cell glucose consumption was significantly inhibited in the presence of either 1 mg/mL (*p < 0.05) or 10 mg/mL (**p < 0.01) Avemar (x + SD; n = 6). Figure 3. Ribosomal RNA synthesis of MIA pancreatic adenocarcinoma cells in response to increasing doses of fermented wheat germ extract (Avemar) treatment after 72 hours of culture. Glucose carbon incorporation into ribose isolated from ribosomal RNA is expressed as molar enrichment. The dose-dependent decrease in of rRNA after Avemar treatment indicates that ribosomal RNA synthesis is the primary site significantly affected by all doses of Avemar treatment with a maximum decrease of 29% after 10 mg/mL treatment (x + SD; n = 9; *p < 0.05, **p < 0.01). R FAJKA-BOJA, M HIDVÉGI, Y SHOENFELD, G ION, D DEMYDENKO, R TÖMÖSKÖZI-FARKAS, et al. INTL J ONCOLOGY 2002; 20: 563-570. Abstract. The fermented wheat germ extract (code name: on cyto-fluorimeter using a monoclonal antibody to the MSC, trade name: Avemar), with standardized benzoquinone non-polymorphic region of the human MHC class I. MSC content has been shown to inhibit tumor propagation and stimulated tyrosine phosphorylation of intracellular proteins metastases formation in vivo. The aim of this study was to understand the molecular and cellular mechanisms of the anti-tumor effect of MSC. Therefore, we have designed in vitro model experiments using T and B tumor lymphocytic cell lines. As a result of the MSC treatment, cell surface MHC class I proteins was downregulated by 70-85% compared to the non-stimulated control. Prominent apoptosis of and the influx of extracellular Ca2+ resulted in elevation of the amount of the intracellular Ca2+ concentration. 20-40% was detected upon 24 h of MSC treatment of the cell lines. Apoptosis was measured with cytofluorimetry by staining the DNA with propidium iodide and detecting the ‘sub-G ’ cell population. Tyrosine phosphorylation of intra-cellular proteins and elevation of the intracellular Ca2+ concentration were examined using immunoblotting with anti-phosphotyrosine antibody and cytofluorimetry by means of Ca2+ sensitive fluorescence dyes, Fluo-3AM and FuraRed-AM, respectively. MSC did not induce a similar degree of apoptosis in healthy peripheral blood mononuclear cells. Inhibition of the cellular tyrosine phosphatase activity or Ca2+ influx resulted in the opposite effect – increasing or diminishing the Avemar induced apoptosis as well as the MHC class I downregulation. The level of the cell surface MHC class I molecules was analysed with indirect immunofluorescence. The benzoquinone component (2,6-dimethoxi-p-benzoquinone) in MSC induced similar apoptosis and downregulation of the MHC class I molecules in the tumor T and B cell lines to that of MSC. These results suggest that MSC acts on lymphoid tumor cells by reducing MHC class I expression and selectively promoting apoptosis of tumor cells on a tyrosine phosphorylation and Ca2+ influx dependent way. One of the components in MSC, 2,6-dimethoxi-p-benzoquinone was shown to be an important factor in MSC mediated cell response. using paired, two-tailed t-test). No difference was found for PBMC (n=2). MSC treatment causes prominent apoptosis in lymphoid tumor cells but it does not induce apoptosis of healthy resting mononuclear cells. Moreover, although MSC blocks the proliferation of PBM cells stimulated with PHA, it does not induce apoptosis in PHA stimulated cells (data not shown).